Recipe courtesy of "The Tabasco Brand Cookbook"
In 5 quart Dutch oven or heavy sauce pan, heat oil over medium-high heat. Working in three batches, brown the beef well, removing each batch with a slotted spoon to a bowl and set aside. Add onion and garlic to pot, cook for 5 minutes until tender and stir frequently. Stir in the chili powder, cumin, salt and Tabasco sauce, cook for 1 minute. Add the water and chilies and bring to boil. 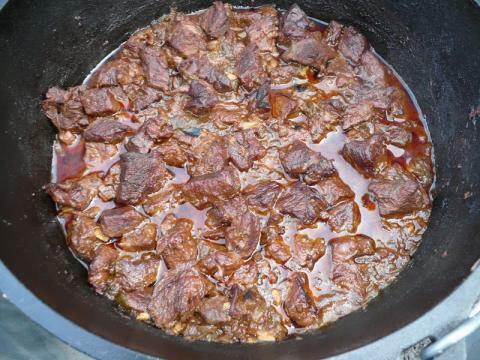 Return the beef to the pot. Reduce the heat and simmer uncovered for 1 1/2 hours until beef is tender.